The Wheel of the Year depicts the annual cycle of holidays celebrated in various Pagan religions. Although holidays like Yule and Samhain are familiar to most Pagans, there are several minor holidays that are scattered throughout the year. The following holidays are mostly celebrated by Germanic pagan religions such as Ásatrú. Ancestors’ Blót may seem self explanatory but the celebration that occurs on November 11th differs from other traditional ancestor honoring holidays. This holiday focuses both on the ancestral group who cared for the land during in past times, as well as a time to honor the wights that live in the physical area surrounding their homes. 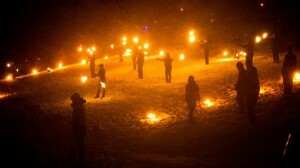 Also known as the Feast of Váli or The Festival of Kin. Váli is a god of righteous vengeance and love between friends, family, and partners. It is on this day that Váli, son of Odin and the giantess Rindr, avenged the death of his brother Baldr by slaying Höðr. Valris Blot is often celebrated by feasting with close friends and family, as well as showing them affection and honor in the name of Váli. Though not an ancient holiday, Yggdrasil Day has become an important tradition created by northern neo-pagans. Yggdrasil Day is a time to respect nature and take action to reseed the land. It is customary to plant a tree during the celebrations, preferably an ash tree. The longest day and shortest night of the year is known as the Summer Feast. Sunna rides her sun chariot as high as it can go in the sky before it makes its decline into the darkness that comes for the winter months. Great bonfires are burned and feasts are dined upon. It is a time to send praise to Sunna so that one might receive her blessings in return. Winter Blót is a day in which the days of summer and winter remain in balance. This is a time to leave offerings for Deities to ask their assistance in the harsher season of Winter. Ancestors and Deities are both honored with toasts of mead, ale, and cider.